If what you were eating was hurting your grandchildren, would you change it? Nearly every diet and nutrition book on the market focuses only on you. Dr. Cate takes nutrition to the next level, providing information not only to help you to heal yourself, but to give your children and grandchildren optimal health. 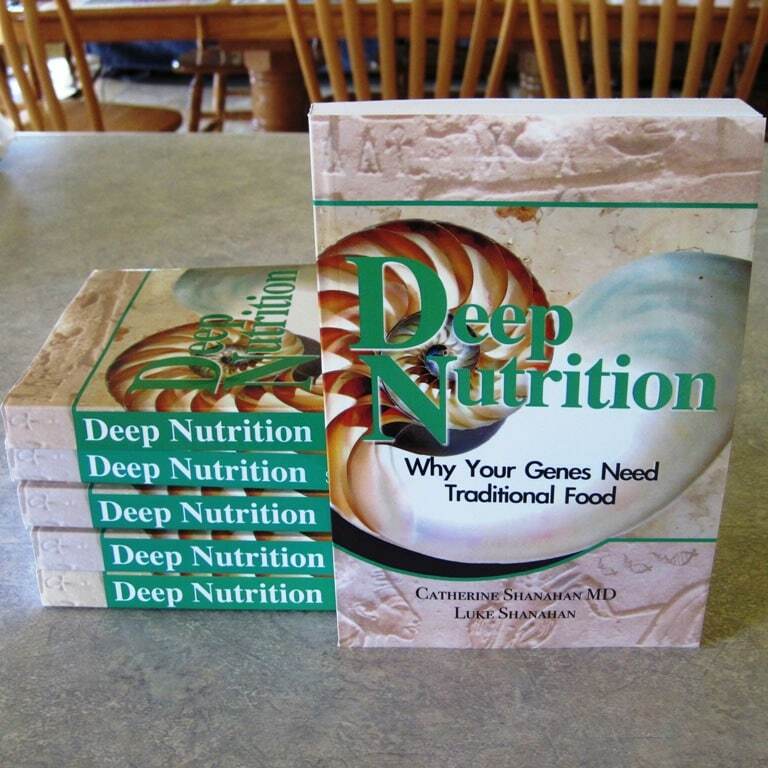 Deep Nutrition combines the latest research on nutrition, health and epigenetics and explains with photos, diagrams and analogies, making it accessible to the layperson. I'm not talking about the kind of beauty that comes from cosmetic surgery or heavy makeup – I'm talking about strength and symmetry, good bone structure, skin tone and vitality that shines through no matter what your age or race. Dr. Cate discusses how traditional foods and fertility practices (spacing births, high nutrient density foods for mom and dad, breastfeeding, etc.) led to genetically superior offspring through the process of epigenetics. Cellulite and sagging skin aren't inevitable with age – they are side effects of a diet lacking in collagen and other tissue building nutrients. She shares how the Marquardt Mask provides concrete evidence that beauty is not simply in the eye of the beholder – that our minds are trained to recognize symmetry and associate it with health. This exterior beauty is associated with interior functionality. It's no coincidence that that more and more Americans require major dental work to get their teeth to fit in their mouths, and more and more couples are facing fertility issues. Narrow jaws are an outward manifestation of poor nutrition – as are many other childhood problems that we now take for granted. I can see clear evidence of this in my own family. One grandma and grandpa used to live on liquid meals in a can and hotdishes made of canned products and noodles. The other grandparents ate homegrown products, but grandpa drank heavily. I was raised on raw milk and whatever we could raise on the farm, but ate a lot of sugar. Husband ate mostly processed foods growing up, with lots of soda. When were were planning a family, I cooked mostly from scratch and took prenatal vitamins, but didn't know about real traditional foods at that time. My boys are strong and healthy overall, but they will likely need minor dental work to tweak the alignment of their teeth. My second son shows clear signs of what Dr. Cate refers to as “Second Sibling Syndrome” – narrower jaw, lighter build, more health issues (nothing serious, thankfully, but more susceptibility to colds, allergies and other illnesses). They haven't had an ear infection since they were babies, and have had no other illnesses requiring outside medical intervention. Contrast this with my kids' cousins. Both sets of grandparents ate a lot of processed foods, as did dad and mom (dad refuses to eat vegetables at all). A typical meal will consist of buttered white noodles washed down with fruit juice or low fat milk. The most worn shelf in their gorgeous walk-in pantry is the one holding ten types of pop tarts. All the children have extremely narrow jaws, necessitating the need for dental intervention at an early age simply to have room in their mouths for their adult teeth to come in (the two eldest children first got braces at age eight). The family is frequently plagued with illnesses requiring antibiotics and ER visits, such as ear infections, bronchitis, pneumonia and other respiratory and digestive infections. This is no way meant to imply that we are better parents, simply to demonstrate the very visible effects of differences in nutrition. This is in no way meant to imply that our children are more attractive than others, as I believe that all children are beautiful. I made this comparison to show that outward appearance (narrow jaws, facial features that don't seem to “fit”, illnesses, etc.) are our bodies signals to indicate that we need better food. You can't turn on the TV without getting barraged with ads for Erectile Dysfunction (ED). Our love affair with fast food, typically prepared with rancid vegetable oil, can be directly correlated with the increase in ED and heart disease. And cholesterol? It's essential to good health, as long as the cholesterol itself isn't damaged. In chapter eight, Dr. Cate explains good fats and bad, and How the Cholesterol Theory Created a Sickness Epidemic. We've all heard of transfats, but Dr. Cate explains how fats she refers to as Megatrans not only cause damage on their own, but actually produce a cascade effect in your system, transferring their damaging properties to other fats, including the ones protecting your internal organs. These Megatrans fats make tissues brittle and susceptible to rips, tears and other damage. Eating foods fried in rancid vegetable oil has been proven to immediately and dramatically reduce endothelial function – leading to ED and heart attacks. The latest government “myplate” guidelines are nothing but the same garbage packaged under a different label. We are still prodded to eat way more carbohydrates than we need for optimal health. In chapter nine, Dr. Cate details how sugar affects your circulatory system, causes birth defects, causes type II diabetes, damages brain cells, dulls your senses, and so much more. If you haven't already moved to reduce your sugar intake, this will make you want to do it. After giving us all “the bad news”, Deep Nutrition wraps up with sound guidelines for improving your health (and the health of your children and grandchildren) through a smart exercise program and better nutrition using the Four Pillars of World Cuisine. Over the past few years, I've been working on adding these foods to our diet (since reading Nourishing Traditions, another nutrition book I highly recommend). I still need to work on organ meats, but the others are regular parts of our menus. (Use the search box on the sidebar to find some of my recipes – type in “probiotics”, “soup”, “broth”, “sourdough”, “fermented” to get started.) My skin is clearer, my hair is softer, my joints ache less, and I have lost around 30 pounds. I can't say enough positive things about eating this way. I'm not super strict about it – I do still use some white flour and white sugar, but much less than I used to use. I have found that if you focus on the foods that are the most nutrient dense, they fill you up and reduce/eliminate cravings for the “anti-nutrient” foods. I've read a lot of books on nutrition, but this one was the first one that prompted me to contact the author directly and order copies in bulk. YOU NEED TO READ THIS BOOK. I've been giving copies to loved ones with new babies (and babies on the way), and my older siblings and other relatives facing age related health problems. No matter what part of your life you are in, this book has information for you. All opinions in this post are my own. I think Dr. Cate has amazing information, but she hasn't bribed me to write a glowing review. She did, however, include a copy of her latest book, Food Rules, with my bulk purchase, which I'll be reviewing in an upcoming post. That's a wrap! Please share this post if you've enjoyed it. I truly this believe this book will change lives, and Dr. Cate will be a wonderful nutrition resource for years to come. *Note – I did give away copies of this book when this review was originally published, but have removed contest information from the post to avoid confusion. Following on FB and Twitter. Thanks! Geeze Louise! Do you also want my right arm??? Well, you know I'll do what I can…but I don't do Twitter and won't do Twitter again….so here's the first deposit of blood. I'll write a post tomorrow. Now for the next few comments. Okie Dokie again…already Networked following…whatever that is. Okie Dokie one more time….already Googled in…whatever that is. Sure you don't want a pint of blood…that would be a whole lot easier!!! I am on Stumble but have no idea how it works…tell you what…give me some extra points for posted this on my FB page!!! Please!!!? I will tell 5 people though..I can think of at least 5 that would benefit from this read. Ok…a few more things to do…now where was I? 3. Liked your page on facebook!! check! #4, also check for FB link! common count that for #5 &#2! are you regretting yet all these demands!? I am!!! E-mailed 5 friends about the give-a-way! Following you with Google Friends Connect! Good advice though. I have one meal a week that's an indulgence. A dessert, waffles, white flour, sugar. The rest of the week I eat game and salads, and stuff from the garden or the local orchard. As a kid we ate some processed food, but it too was a rare treat, to this day home made applesauce with minimal added sugar is one of my favorite snacks. So funny, I just started reading this book yesterday. Its fantastic. I follow you through Google as well. This book looks really interesting. I have it on my future reading list now. Thanks for the tip! tweeted http://twitter.com/#!/apronmama721/status/98145535726329856 and i follow u! I liked you on facebook. I love this book! I borrowed it from the library, but had to return it before I was done. I want to get my own copy. I e-mailed this to five friends too. Just tweeted about this give away. Crossing my fingers…. I am now following you on Twitter and I tweeted the info as well. I "liked" your facebook page. I would love to win this book. I am dealing with Lyme disease (again) and perhaps this would help in the healing process.